On December 20, 2018, the Agricultural Improvement Act of 2018 (2018 Farm Bill) was signed into law, continuing federal support to a number of renewable electricity and bioenergy-related programs. 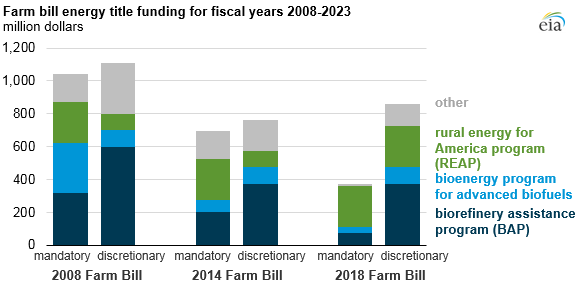 Authorizations in the 2018 Farm Bill cover fiscal years (FY) 2019 through 2023, during which time energy programs will receive $375 million in mandatory funding, with up to an additional $860 million in discretionary funding. These spending levels represent a 46% decrease in mandatory funding and a 12% increase in discretionary funding compared with the 2014 Farm Bill. Even though discretionary spending increased, discretionary federal support is inherently uncertain because this funding must be authorized by Congress in future appropriations bills. Farm bills have tended to be large, multi-year pieces of legislation that outline federal support to a diverse set of rural and agricultural programs administered by the U.S. Department of Agriculture (USDA). The 2002 version of the farm bill was the first to include a dedicated energy title, Title IX. Subsequent farm bills in 2008 and 2014 either created, extended, or repealed these programs. The 2018 Farm Bill reauthorized most Title IX programs at the same or lower funding levels relative to the 2014 Farm Bill. Title IX federal subsidies are provided to eligible recipients in the form of project grants, guaranteed loans, and direct payments. The most common form of assistance is a USDA-guaranteed loan, where the USDA assumes the responsibility for the amount of the loan in case of default. The share of USDA-guaranteed loans under Title IX programs more than doubled during the past four years, from approximately 40% during FY 2009–2013 to more than 80% during FY 2014–2018. Several Title IX programs account for most of the federal support provided, with the largest amount of funding awarded to the Rural Energy for America Program (REAP). REAP offers grants and loan guarantees to agricultural producers and rural small businesses to promote the installation of select renewable energy systems, particularly solar, and energy efficiency retrofits. REAP is set to receive $250 million in both mandatory and discretionary funding over the duration of the 2018 Farm Bill, accounting for two-thirds of mandatory funding and nearly one-third of discretionary funding. 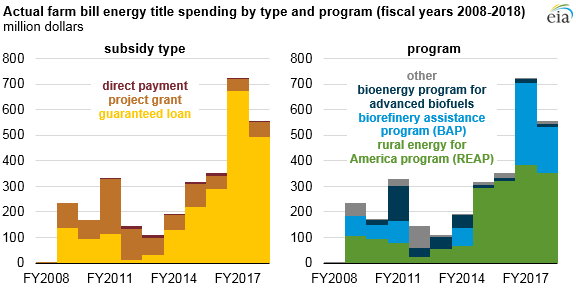 The Biorefinery Assistance Program (BAP) and the Biorefinery Program for Advanced Biofuels programs account for much of the rest of Title IX authorizations, or approximately 30% of mandatory and 55% of discretionary funding. Through BAP, USDA provides loan guarantees up to 80% of total eligible project costs up to $250 million for the construction of advanced biofuel facilities and other qualifying technologies. The Bioenergy Program for Advanced Biofuels provides cash payments to biorefineries to encourage the production of advanced biofuel. Mandatory funding for both programs was reduced in the 2018 Farm Bill. Other Title IX programs generally receive smaller levels of government support or are more dependent on discretionary spending. These programs involve the growth of biomass energy crops, biodiesel education, bio-based product labeling, and other energy-related issues. Overall, spending on Title IX programs will represent a small fraction of the overall farm bill, which was valued at $428 billion during FY 2019–2023 by the Congressional Budget Office.